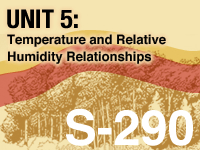 “S-290 Unit 5: Temperature and Relative Humidity Relationships” module focuses on methods of describing humidity in the atmosphere and how temperature changes can affect relative humidity. Topics from this module will be further related to effects on potential fire behavior in other modules of the Intermediate Wildland Fire Behavior Course. It is STUPID, that you can't see the correct answer when you get a question wrong...! This is NOT a good way for someone to learn, but a way to keep people from passing on quiz answer. This is NOT a way for student to learn...! Too much info with little detailed explanation. The graphics and explanations are great. I am really enjoying this online version of the course. It far exceeds some instructor led courses I have taken. Under Local Effects-Topography Module Subsection: Upon Review of the Aspects I noticed an error. On South facing aspect check out how spread is spelled. This is helpful for calculating fire behavior risks for firefighters on active fires. Information is well planed out and given that you can understand it. This (and so far all units) have been fascinating and completely relevant to wildland fire fighting. All units have been well laid out and simple to do. Over all a very helpful courses. A thoughtful way of improving learning! This unit explained the question of fronts to me in a very understandable way by describing what air masses characteristics there are. Lessons were presented in an easy to understand way using simple language. I found it very informative.However, the video component didn't work and I had to use the print version. Good explanation of temperature and relative humidity. Test items with distractor answer options must be clear enough to provide a valid distraction between the correct and incorrect understanding of the underlying concept being tested. Clever "gotcha" distractors may give the test creator a sense of self-satisfaction but do not validly assess student understanding. Best practice pedagogy would caution, "Best" answers should not be a competition between the test writer and the student as to who is the most clever. did not really like this one. The format made it hard to understand. This class is exactly what a person needs to learn to work around perscribed fires. The things that I learned were different from what I previously thought.This lesson was critical. Good visual aids and graphics. Sometimes the material was explained in a confusing fashion. The table portion of the lesson was confusing. I would need more specific instruction on use of that table. Good lesson not very long and explains in great detail. I really learnt new stuff. Overall how the winds affect temperatures and RH. Anyway these statements are kind of scientific but actually we must really know our local weather and climatic conditions. Somehow like critical RH variates depending on the area. increased my knowledge on the relationship between temperature, dew point, and RH. I think the charts for the wet and dry bulb could be expanded a little. On one of the test questions I was unable to correctly answer the dry bulb of 34 and a wet bulb of 35.
core definitions should be prioritized. Psychometric charts are hard to read. Allow me to zoom into whole chart, not just cell. a little confused on why a cold front is just called cold front even though those winds tend to be warm, dry continental air masses. Not happy about the surveys. good lessons, helped understand better. Excellent Module . Great exercises to re enforce learning. This was a very good module on Relative Humidity and Temperature. I would recommend this module to any one wanting to learn more about RH. It is very easy to understand. I'm not a firefighter but this was the only in-depth treatment of RH I could find. I was actually entertaining. 1. Describe the relationship between dry bulb temperature, wet bulb temperature, dewpoint temperature, and relative humidity. 2. Describe typical day and night (diurnal) variations in air temperature and relative humidity. 3. Determine relative humidity, dewpoint, and wet bulb temperatures using a psychrometric table. 4. Describe the effects of topography, vegetation, clouds, and wind on air temperature and relative humidity. 5. Describe the temperature and relative humidity characteristics of continental and maritime air masses.